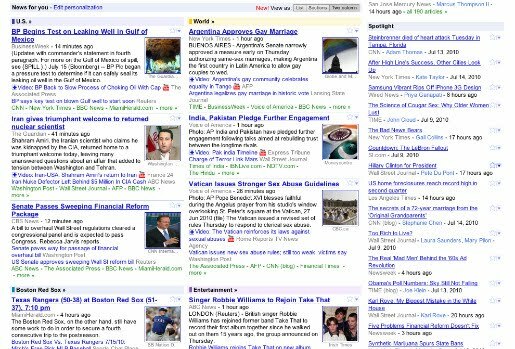 Two weeks ago we gave the Google News homepage a new look and feel with enhanced customization, discovery and sharing. This redesign was our biggest since Google News launched in beta in 2002. Some of you told us that you really liked it, especially how the "News for you" section lets you see a stream of articles tailored to the interests you specify. The positive usage data we saw during our months-long tests of the redesign has continued since we introduced it to all users of the U.S. English edition, and hundreds of thousands of you have already customized your Google News homepages. But some of you wrote in to say you missed certain aspects of the previous design, such as the ability to see results grouped by section (U.S., Business, etc.) in two columns. A key goal of the redesign was to give you more ways to personalize your Google News, and these changes add even more choices. A heartfelt thanks to all of you who have shared your thoughts with us. Please keep letting us know what you think, and we’ll keep working to make Google News even better.